All goods supplied by Anatech Inc. are sold subject to the following conditions, and acceptance of any goods shall be deemed to constitute full acceptance of these terms. All goods remain property of Anatech Inc. until the total invoice is paid in full. Any prices quoted are in Canadian dollars. Any listed pricing subject to change without notice. Please inspect all orders upon receipt. In the event items were ordered or shipped in error, you must notify the Customer Service Department within 10 days of receipt to ensure proper handling. PST will be charged on all PST applicable items if PST number not provided. Minimum order – free economical shipping: $400.00 (certain exceptions apply. i.e. oversized items and raw materials not applicable). Remote rural areas: applicable surcharges may apply. Contact head office to inquire. A service charge of $25.00 will be levied on all NSF cheques. Due to Anatech's continuing effort to improve our product lines, we reserve the right to alter product design and specifications without notice. If your order needs to arrive by a certain date, please bring it to our attention at time of ordering and customer service will do their best to arrange for special handling and if needed obtain a quote for a faster method of shipping. Overnight Express, 2-day and 3-day Eco Express are also available upon request. Special arrangements for a default courier can be set up on your account. If certain couriers are not reliable in your area, please contact customer service. If you prefer to have your order(s) shipped collect via a specified courier, please provide freight company and your courier account number at time of ordering. Anatech offers free economical shipping on all orders over $400 before taxes (certain exceptions apply. i.e. oversized items and raw materials not applicable). Remote rural areas: applicable surcharges may apply. Contact head office to inquire. Anatech offers custom manufacturing on many of our AnaPrene, AnaTex, webbing and elastic supports. All customs are manufactured in our warehouse based in British Columbia, Canada. Contact customer service to discuss your custom options. Hard copies with all specifications and measurements are required for all custom orders and once processed cannot be cancelled. Please note: Measurements should be taken by qualified fitter for acurate fit. The patterns for custom orders are kept on hand for 12 months; it is essential that you give your patients name at time of ordering as they may need to reference for re-ordering or alteration purposes. Please note: Apart from the fact that the patients sizing may change over time, all materials have a tendency to distort through wear and washing. Therefore, Anatech accepts no responsibility for the accurate fit of repeated patterns or the copy of an old brace. When ordering a repeated pattern, please quote the original invoice, purchase order number and or order date along with the patient's name. Detailed tips can be found on custom order forms and some fitting instructions. Anatech Inc. warrants all goods to be free of defects in material and workmanship upon leaving our facilities and agrees to, at Anatech’s option, replace or repair faulty products free of charge for three months from date of purchase. This warranty does not apply to goods misused or damaged due to accident or improper handling; to goods that have been altered; to goods that have been in contact with harmful substances (i.e. chemicals, oils, solvents, etc.) or to goods subjected to improper washing methods. Anatech is not responsible for, nor does this warranty cover, any adverse reactions due to allergies from any material used in our products. If you have a particular concern, please call to request a sample piece of material to do patch testing on possible sensitive patients. Goods returned without prior authorization will not be accepted. Please have the following information ready from your records and your customer, in order to obtain your Return Authorization Number. Picture along with copies of above, may be required for some items to avoid unnecessary shipment. Goods returned for warranty must be in a clean and hygienic condition. For reasons other than warranty or error. All items are applicable to a 10% restocking fee. Items must be in resaleable condition in original packaging. All returns must be shipped prepaid to Anatech and must have Return Authorization Number indicated on the outside of the package. Include all above required documents/information with return. Upon examination of all returned goods, Anatech will repair, replace or credit any items that fall under our warranty policy at our discretion. Our return to you will be prepaid via our courier. If you should prefer another courier, the items will be shipped freight collect. Footlogics Hockey Plus orthotics are specifically designed for ice hockey players. 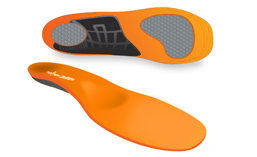 By supporting and cushioning the feet, this unique insole provides both comfort and control. Without proper support the foot collapses, the legs rotate internally, twisting the knees and decreasing stability. Power transfer and push off become less efficient, reducing control. The risk of stress and overuse injuries increases. Using Biomechanical Reinforcement Technology (BRT), Hockey Plus re-aligns the feet and prevents excess pronation. The result is improved stability, balance and control. More efficient power transfer makes edging, stopping and push-off more efficient, while reducing fatigue. Plus, cushioning pads in the heel and forefoot makes Footlogics Hockey Plus very comfortable to wear!